Container flower gardening is the perfect alternative for beginning gardeners, those who lack space, or those whose gardening ambitions are small. New gardeners can enjoy the craft without the intimidation of building a large garden. Those who lack space can limit the size of their gardens by the size of containers they use. Others may simply want to enjoy gardening without having to maintain a large garden space. The success of your container garden will largely depend upon choosing the right size containers for your plants, the right location for your plants and using the proper soil and fertilizer. This article offers some tips on each of these factors. Many gardeners make the mistake of using containers that are too small for their plants. This causes unnecessary crowding among the roots and prevents the plant from absorbing water and moisture efficiently. When a plant grows, its roots grow into the soil in search of moisture. When a plant is forced to grow in a container that is too small, the roots become crowded and the soil is unable to contain as much moisture. As a result, frequent waterings are necessary to maintain the plant's health (especially during the summer when moisture is absorbed quickly). Make sure the container you use is large enough for both the plant and the growth of its roots in the soil. The container should be large enough to allow roots to spread out and seek moisture without becoming crowded and entangled. Different plants need varying amounts of sunlight and shade. While some plants thrive with a lot of direct sunlight and little shade, other's growth and health can be impacted by the same amounts. Fortunately, container flower gardening allows plenty of portability. As long as you can lift a container, you can place the plant anywhere you need in order to ensure it gets the sunlight it needs. You should consider the locations in your home that receive sunlight and the times of day that sunlight is available. Also, keep in mind that many plants can be harmed by sunlight reflected from pavement and lightly-colored walls. Lastly, consider that the amount of sunlight available to your home will change as the seasons change. Therefore, make sure you compensate for these changes regarding your container locations throughout the year. If you have questions regarding the amount of sun your plant should be exposed to, check your plant's individual labels. Your plant's ability to grow and flourish will depend largely upon the soil and fertilizer you use. Make sure the soil is devoid of any harmful elements such as insects and disease organisms. The soil should have a mildly-acidic pH and be capable of holding both water and the nutrients your plants need. Most experts recommend avoiding native soil as it often has clay particles that virtually squeeze much-needed oxygen from the soil. Plants grow quickly in containers. This leads to the fertilizer in the soil becoming depleted quickly. To ensure that you use the right amount of fertilizer in the soil, use Controlled Release Fertilizer as you're placing the soil in the container. Because container plants grow quickly, they often place high-demands on the time-released fertilizer. To compensate, add fully-soluble fertilizer to the water used to irrigate your plants as a supplement. There are many container flower gardening devotees who prefer the craft over traditional gardening. They enjoy portability, a limited scope for their gardens and the joy of gardening without the effort of creating a large garden project. 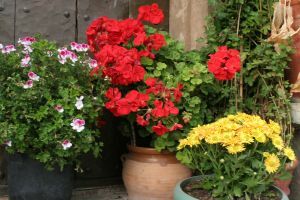 By using the right sized container for your plants, placing them so they get the proper amount of sun and shade and using the right soil and fertilizer, you can have a successful and flourishing container flower garden.